Distributed through Ocean Avenue Entertainment, this powerful documentary chronicles the transparent and honest last days of a woman and who allowed the world to walk beside her during her cancer journey. Kara's is a story of living and dying with grace, humor, dignity, and loads of love. Today, on the 4th anniversary of Kara Tippetts passing, a highly anticipated documentary releases that shares her powerful story of living and dying with grace, humor, and dignity. 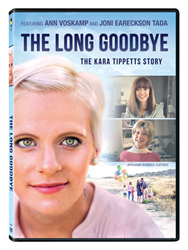 Including interviews and conversations with including Joanna Gaines, Ann Voskamp, Ellie Holcomb, Jim Daly, and Joni Eareckson Tada, THE LONG GOODBYE: The Kara Tippetts Story shines in its authenticity. Filmmakers Jay and Sofia Lyons came upon Kara’s story, and instantly wanted to help. What began as a short video for her blog blossomed into creating a feature-length film, documenting her final days, and sharing her compelling story. Kara’s life impacted readers of all demographics, including cultural influencers who were touched by her life’s message and simply wanted to help. Many shared her posts. Others became personal friends. Others reached out in creative ways. Travis Cottrell, Selah, and filmmaker Sofia J. recorded music for the project. Documented in THE LONG GOODBYE are a house concert performed by Ellie Holcomb, creative mentorship from Ann Voskamp, friendship with Joni Eareckson Tada, and a very personal gift to Kara’s family from Joanna Gaines.